"Tom, that strange gas is fantastic--disintegrates everything it touches! What do you think it is?" 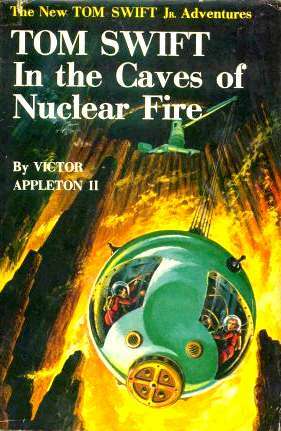 Fascinated by the amazing report from a pilot who crash-landed in the African jungle, Tom Swift Jr.'s eyes glow with curiosity as he replies: "Sounds like antiprotons rampaging. Such a phenomenon is unknown on earth. This may be the greatest discovery of the century. It could revolutionize the whole science of atomic energy. Let's investigate that taboo mountain." Although several of the young inventor's associates view his latest expedition with skepticism, Tom sets off in the Flying Lab for the Dark Continent to fathom the secret of the mysterious mountain. The deadly vapors which have terrified the natives for generations challenge even the scientific genius of Tom and his companions. When their atomic drill inexplicably is sucked into a forbidding peak. A series of startling events threaten the Swift expedition. How Tom, with his new invention the Terrasphere, conquers a heretofore unknown, violent quirk of nature brings this breath-taking story to a spectacular finish. The following summary was written by Ardith Hoyt. Thanks for volunteering! The craftsman was referring to Tom's new invention, a vehicle specially designed for the exploration of cave systems and areas of very rough terrain. It was a low-slung, streamlined tank eighteen feet long, powered by nuclear-activated steam turbines. These would drive a set of caterpillar treads. The driver's cabin was located in the rear and a hoisting crane rested along the top, nearly the length of the roof. The unique feature of the invention was its main cabin which nestled on the forepart of the chassis. Spherical-shaped, with two wide windows, the cabin was removable. When the crane was in operation, cables hanging from it were attached to the cabin to swing it away from the chassis, and raise or lower it. Occupants of the cabin could safely explore and study deep chasms or caves which other vehicles could not penetrate. The cables mentioned above broke twice. The first time, they all broke at once, when Tom was testing the machine. The second time, half of them broke down in the cave, putting three people in danger. I bet Tom spent a while perfecting the cables before he let the Terrasphere be mass-produced! The vehicle was also resistant to radiation and fire (a fact which both Bud and Tom forgot at different times), even the gas from the caves, once it had it's coat of Inertite. "They're containers I had made up to get samples of that African gas," Tom explained. "According to Craig, it disintegrated his crockery and metal bottles, but I'm hoping one of these more refractory capsules will hold the gas." He picked up a sheaf of papers from the workbench and handed them to Bud. "These are the 'specs' on each of the containers - what material was used to make them and how. Read them off to me, please, and I'll stamp the symbols on each one." "Right," Bud began reading: "Heavy glass, lead, asbestalon-- That plastic asbestos of yours ought to do it." He went on reading, "Tomasite - Pal, I'd bet on that one any day." Bud knew that this plastic, transparent paint, which Tom had invented, was heat-resistant and radiation-proof, and a three-inch thickness of it would protect the engine of an atomic power plant! Then next morning Tom resumed work. For him the day passed quickly, as he tried experiment after experiment. Again when night came, there was another intrusion by Bud and Craig. "You two are like a couple of mother hens," Tom remarked, laughing. "But I suppose I owe you an explanation. Since crushing the rock, I've been trying to concoct a paint for covering containers. So far, I've had no success." "Do you think you'll solve it?" Craig asked. "I will!" Tom declared. "next, I'm going to try a paint using a gelatin base. To the gelatin I'll add a portion of the finely ground rock. The combination will be a colloid. With luck, it might work!" Apparently, it did. The bottles painted with this stuff didn't disappear like the others. They named it Inertite, and promptly painted the Terrasphere with it. Now Tom was finally able to collect his gas samples. Hanson and Sterling helped him to construct a special box-shaped chamber for this experiment. After the walls of the chamber had been heavily coated with Inertite, electronic measuring devices were attached to recesses built into the top of the chamber. Tom carefully placed one of the containers inside the chamber and by remote control released a small quantity of the gas into the enclosure. The results of the initial test revealed some startling facts. The gas proved to give off antiprotons, as Tom had suspected, but he was amazed to learn that it had an atomic weight of 286. This value was unknown to the atomic table! "Öthe properties of this gas are different from anything yet know to science," Tom told his friends. "It may turn out to be the greatest discovery of our age!" Everyone was excited, but also awed and a little worried. "That stuff is pretty dangerous!" commented Hanson. "Will it ever have any practical uses?" "It's only a matter of learning how to harness the gas," Tom declared. "Already I see the possibility of using it to form completely new isotopes." First of all," said Craig, "what's antiproton matter?" "To explain that," said Mr. Swift, "you'd need a basic idea of how atoms are constructed." "I took some science in school," Craig replied. "I know that the popular concept of an atom is that it looks like a miniature solar system. In the center is a nucleus. Moving around it are particles called electrons. The whole thing is similar to our own planets moving around the sun." "That's basically it." Mr. Swift nodded. "An electron has a negative charge. A proton is the positive charge of the nucleus. Then we have the neutron, which is the uncharged constituent of an atomic nucleus." "That much I understand," said Craig. "Now in antiproton matter," Tom took up the story, "the atoms have the same 'solar system' setup you mentioned, but there's one difference. The charges on the particles are reversed. What was the electron is now a positron and what was the proton is now an antiproton." "I suppose," Craig said, "there's a completely different reaction if they come into contact with foreign substances." "Definitely!" Mr. Swift broke in. "If enough antiproton matter reacted with substances here on earth, the heat produced could start a chain reaction. The world could blow itself into oblivion!" "Wow!" exclaimed Craig. "That stuff wouldn't be anything to play with!" "No," Tom agreed, "but it actually could be put to good use." This gas came originally from the caves, which were amazing in themselves. "Wow!" exclaimed Bud. "What a sight!" The cavern walls were glowing phosphorescently. Every bit of rock surface seemed to be aflame with a cold, green-white light. "Remarkable!" said Craig, "but it's sure eerie. What do you think is causing the cave to glow, Tom?" "It must be a secondary reaction of the gas," the young scientist theorized. "The atomic structure of the rock is being excited. That would produce such an emission." Tom continued to drill until he had made an opening large enough for him to crawl through, then the blaster was withdrawn. Immediately a red glow could be seen in the opening. Tom, his heart pounding excitedly, crawled through. He caught his breath at the sight. Below was a deep pit whose red, green, and yellow phosphorescently glowing walls formed a sheer drop of over five hundred feet! 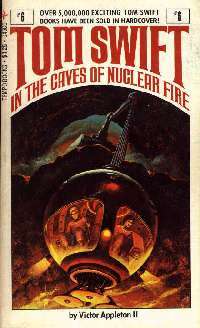 "A cave of nuclear fire!" Tom exclaimed. Below he could hear a rushing river which he was sure no man had ever explored. He looked far down into the pit - he could hardly wait to descend into it at low tide with the sphere. Apparently the river, which ends at the sea, goes up and down a little with the tide. This causes water to dash against the side higher up, against "uranium ore and a nuclear catalyst. The protons produced from the water trigger a nuclear fusion of the uranium with other atoms in the mineral bed to produce Exploron." So, how practical are these things? The Terrasphere seems reasonable, perhaps without it's own nuclear power plant. In fact, vehicles like this may have already been made. Inertite, Exploron, and the caves are another story. First of all, the only way to make antimatter on Earth is with a giant particle accelerator, and then only a few particles at a time, which soon meet with ordinary matter and are annihilated. Any large source of antimatter would destroy itself, since there is no way to protect it from ordinary matter, which is what this world is made of. If there was that much antimatter produced in the caves, the caves would disintegrate, blowing up a large portion of the surrounding area. Antimatter colliding with ordinary matter makes a LOT of energy. Also, uranium is not likely to fuse with anything. It just has too big of a nucleus. We haven't even been able to produce controlled fusion with nuclei of two or three particles, and that takes temperatures of a hundred million degrees. Even stars can't fuse elements as heavy as uranium. Even if such a thing could happen, it would produce far, far more energy, as would any antimatter produced. Yet another problem is that I don't think any element, even one as heavy as this Exploron could decay to produce antimatter. They are just two completely different things. Tom reached into a hidden recess of his belt. From it he withdrew a handful of capsules and handed several of them to his companions. "What are these?" asked Dilling. "Extinguisher capsules," replied Bud. "Tom invented them." "Start throwing the capsules into the fire," Tom ordered. "Spread them around." As the tiny extinguishers landed in the flames, each exploded in a thick, white cloud of smoke. Miraculously the fierce flames began to vanish. Soon they had all been quenched. "These capsules are remarkable," said Dilling, as the trio started back to the car, carrying the dummy with them. These little extinguishers would be pretty nice to have around. Think of the ease with which firefighters could fight fires! Unfortunately the book doesn't really say how they were made, and what they were made with. It does seem a little improbable, though, since it would be hard to fit something that potent into such a small space.